Located in small village.Photographed 6/5/2003.Main Sorthern line, operable.Very new steel silos ; construction date and capacity unknown. Located on edge of small town . 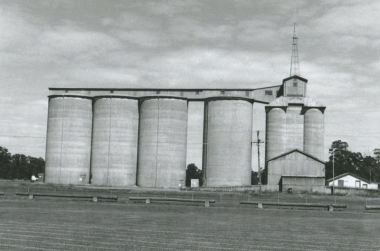 Original concrete silo type S068 [6800 Tonne capacity] built in 1922, also known as a Metcalf. 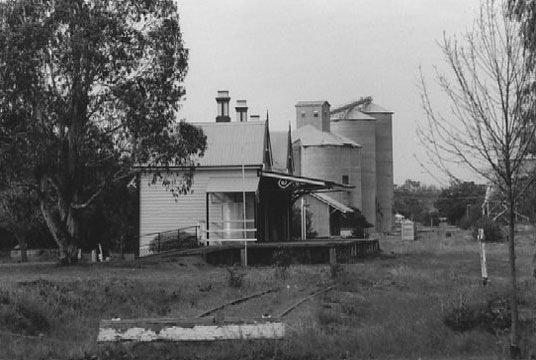 Located in village [1 hotel,1 general store still operating]. 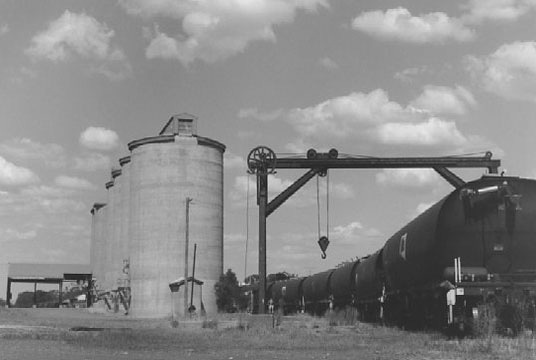 Bulkhead C409 [40900 tonnes capicity] built in 1965. Concrete silo type S041 [4100 tonnes capacity] built in 1928. 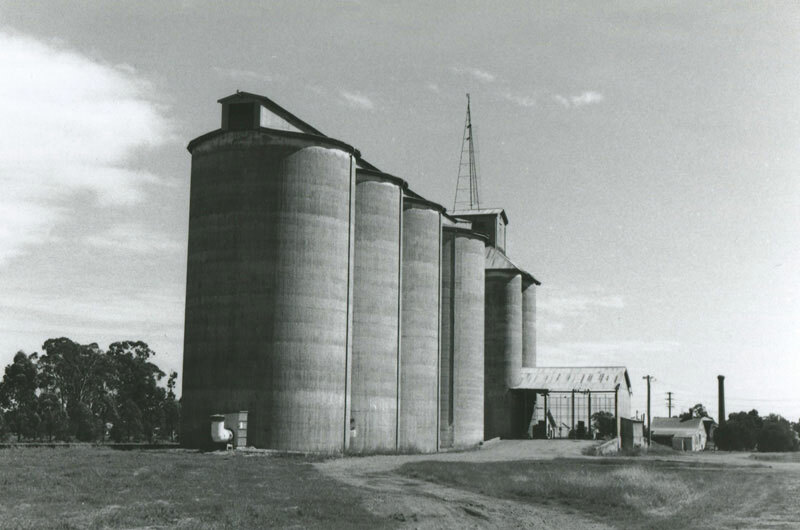 Concrete silo type S027 [2700 tonnes capacity] built in 1936. 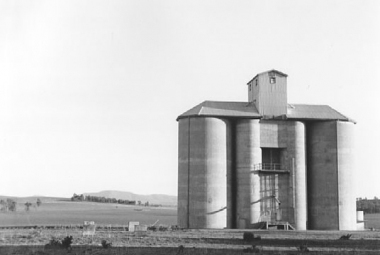 Concrete silo type S068 [6800 tonnes capacity] built in 1920. 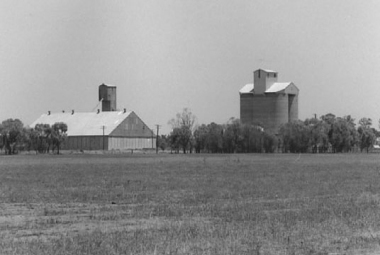 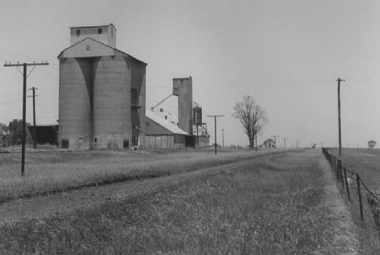 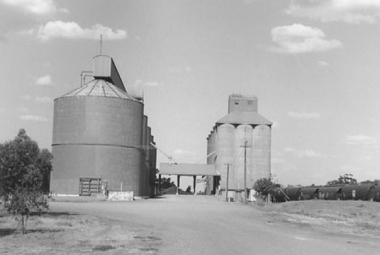 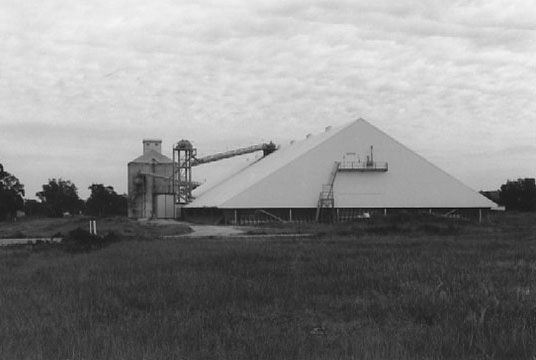 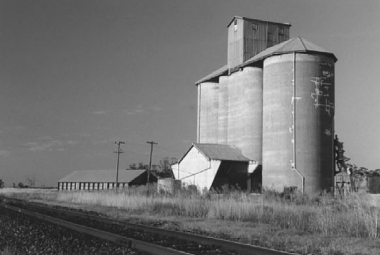 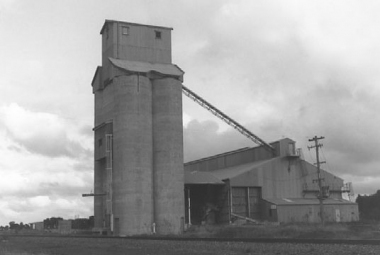 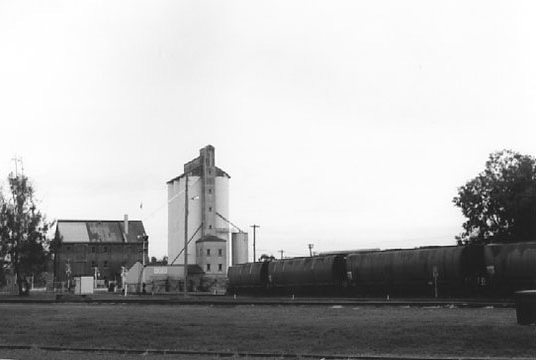 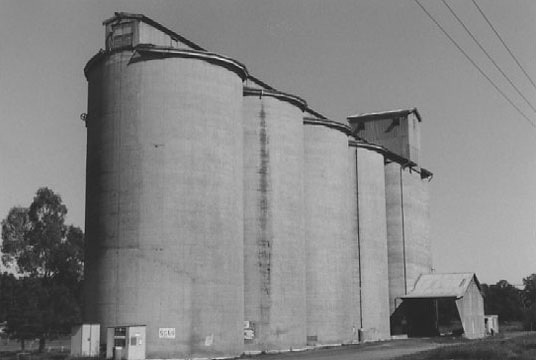 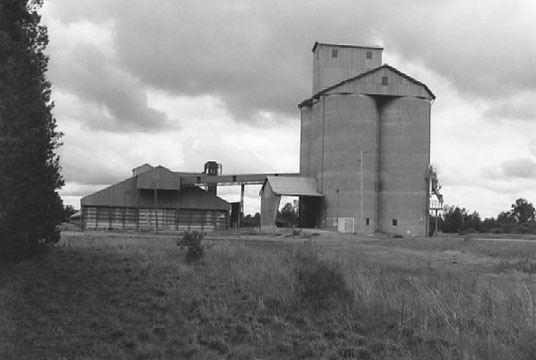 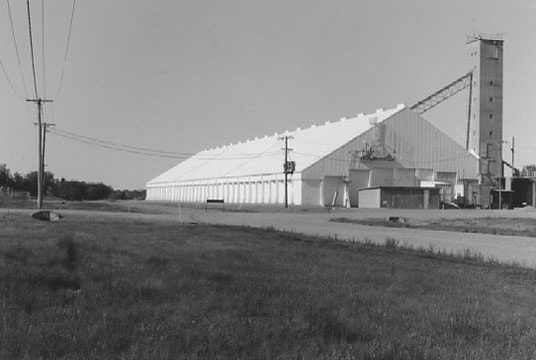 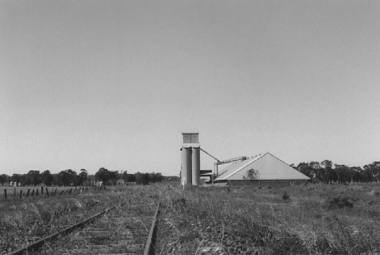 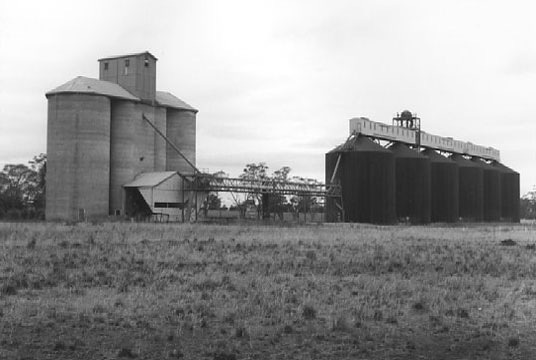 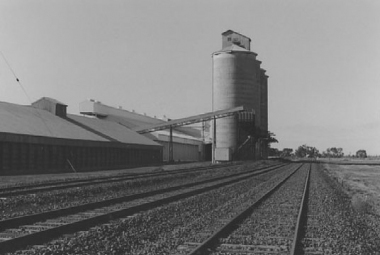 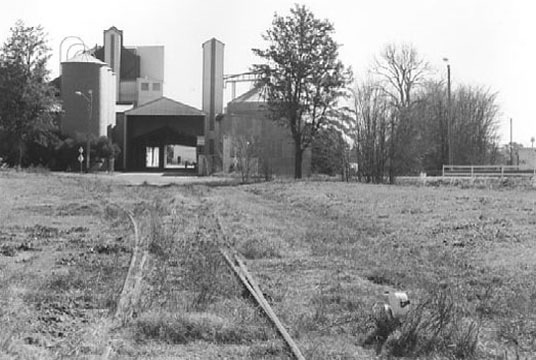 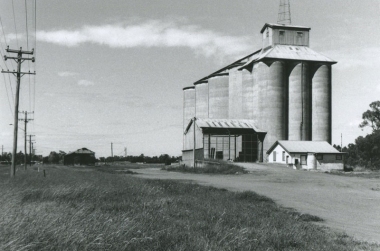 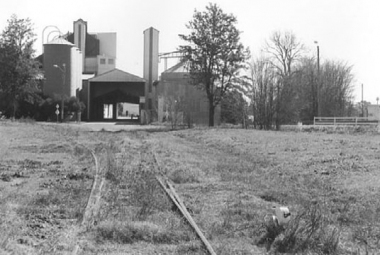 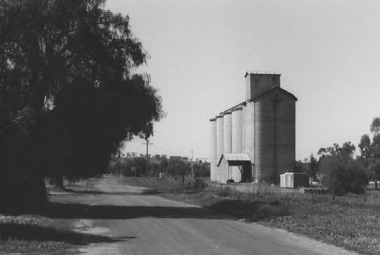 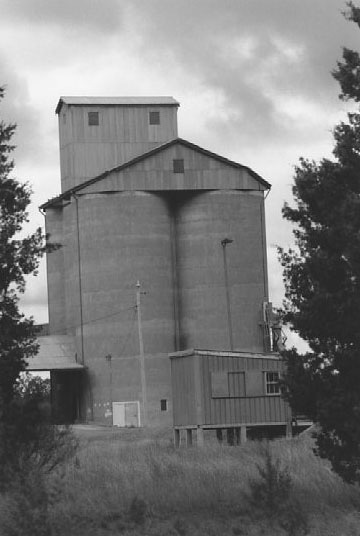 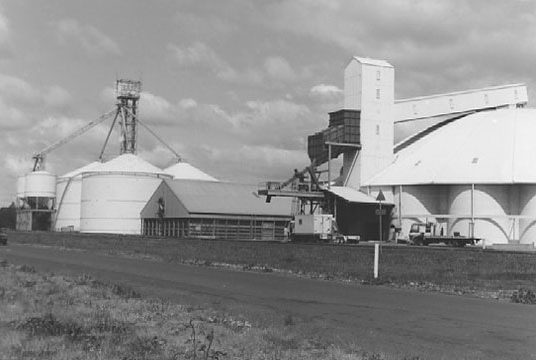 An additional 4 bins constructed in 1938. 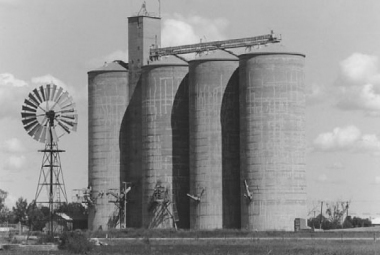 Concete silo type S008 [800 tonnes capacity] built in 1930. 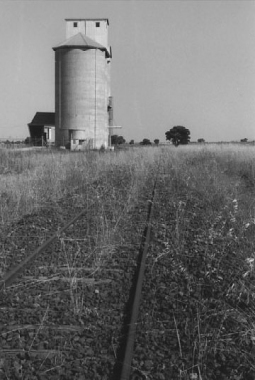 West Tamworth to Barraba line, abandoned. Concrete silo type S027 [2700 tonnes capacity] built 8in 1934. 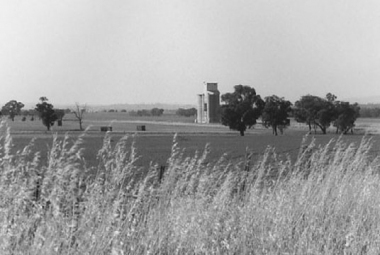 Located out of town off Newell Highway. Scalloped concrete silo type A191 [19100 tonnes capacity] built in 1955. 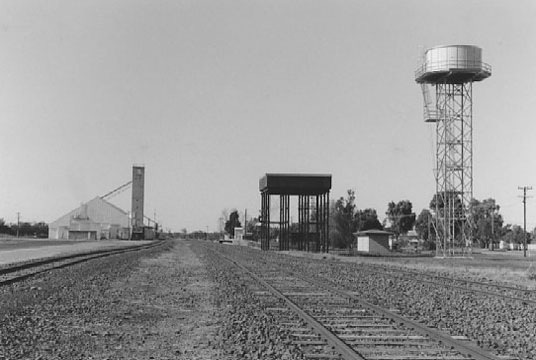 Wyalong to Lake Cargelligo line,operable. Concrete silo type S068 Metcalf [6800 tonnes capacity] built in 1922. Concrete silo type S016 [1600 tonnes capacity] built in 1935. 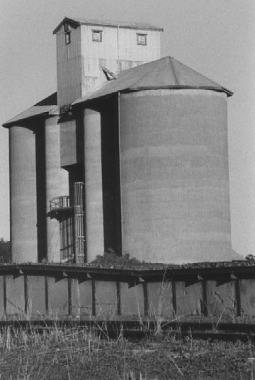 Concrete silo type S016[1600 tonnes capacity] built in 1933. Concrete silo type S052 ? 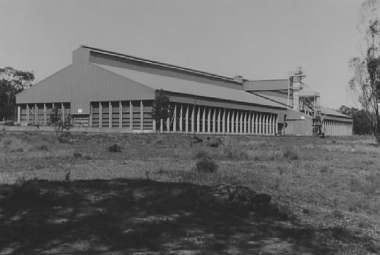 [5200 tonnes capacity], date of construction unknown. 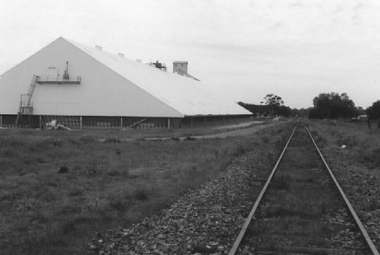 Also C288 bulkhead [28800 tonnes]built in 1969, known as C Depot. 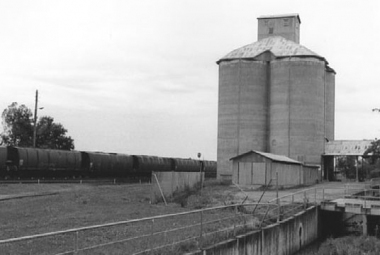 Concrete silo type S052 ? [5200 tonnes capacity], date of construction unknown. Also C288 bulkhead [28800 tonnes] built in1969,known as C Depot. Location only a few kilometres from township. 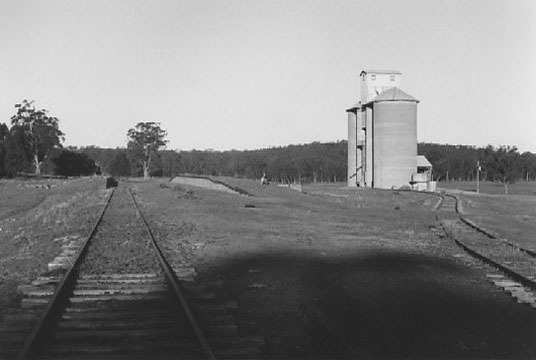 Cowra to Eugowra line, abandoned. 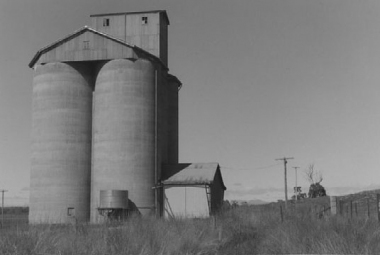 Original concrete silo type S024 [2400 tonnes capacity] built in 1931. Extra bin[s] added in 1941. Cowra to Eugowra line abandoned. 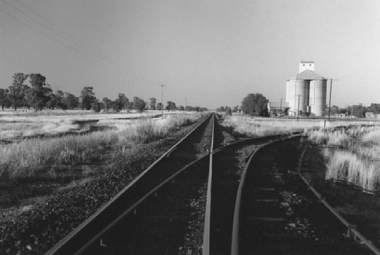 Parkes to Narromine line ,operable. 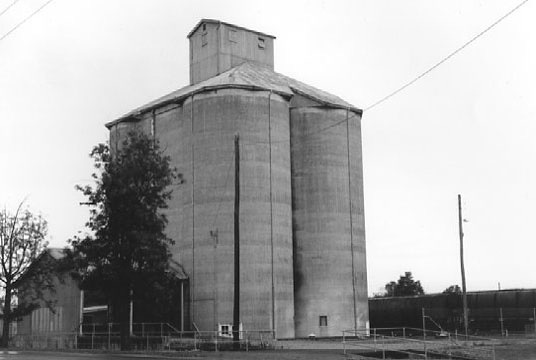 Original concrete silo type S024 [2400 tonnes capacity] built in 1930. Also a small bulkhead,possibly one of the first built [date and capacity unknown]. 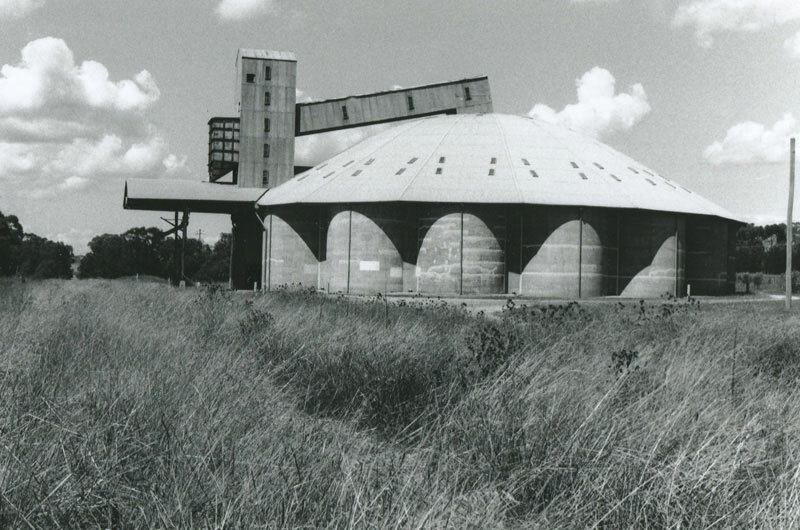 Original concrete silo type S024 [2400 tonnes capacity] built in 1930. Moree to Inverell line, abandoned. 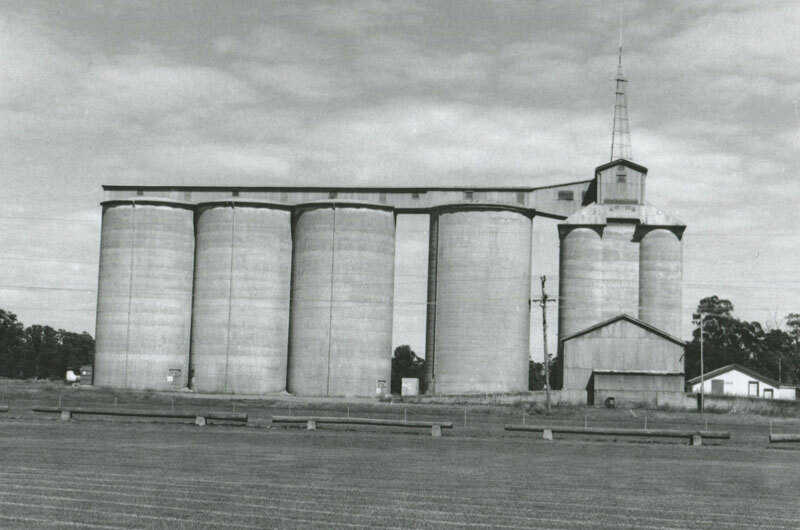 Original concrete silo type S016[1600 tonnes capacity] built in 1934. 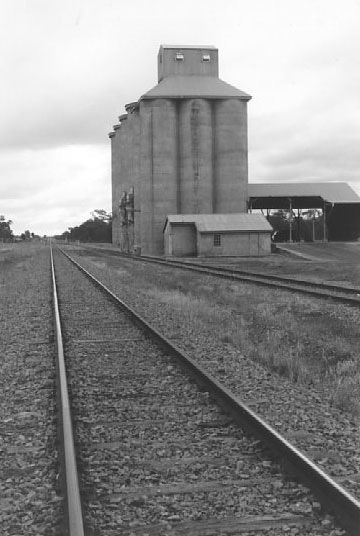 Bulkhead D150 [15000 tonnes] added in 1967. Original concrete silo type S027 [2700 tonnes capacity] built in 1935. Bulkhead B067 [6700 tonnes] added in 1959,also known as B Depot. Original concrete silo type S041 [4100 tonnes capacity] built in 1926.Also large bulkhead, construction date and capacity unknown. 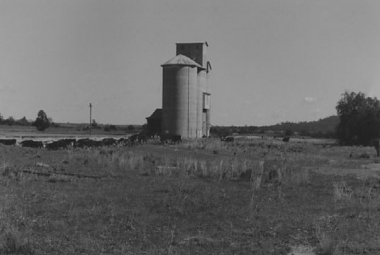 1926.Also large bulkhead, construction date and capacity unknown. 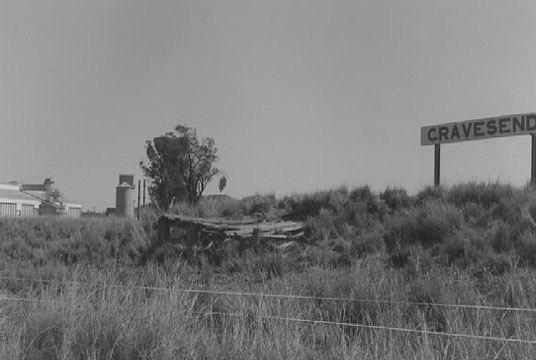 Located at end of main street in town. 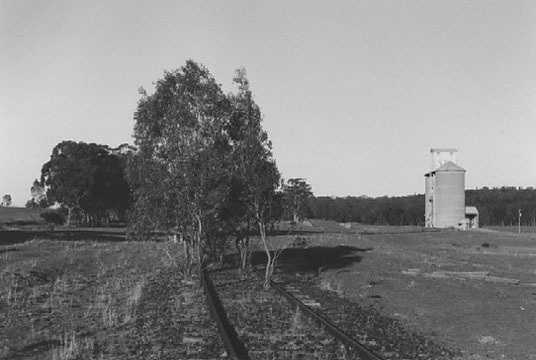 Koorawatha to Grenfell line, disused. 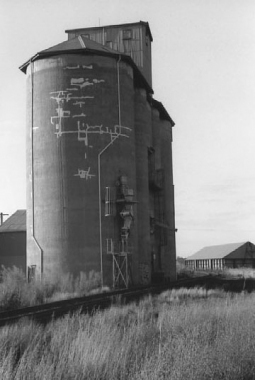 Original concrete silo type S041 [4100 tonnes capacity] built in 1926. 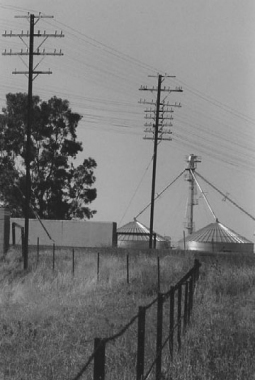 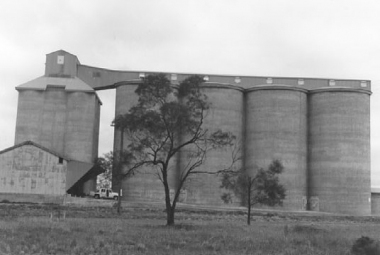 Extra bins added in 1960 [8700 tonnes]. Bulkhead D150 [15000 tonnes] built in1968. Located in small town on Newell Highway. 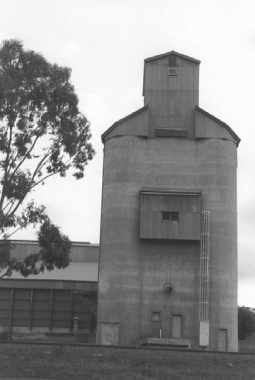 Original concrete silo type S082 Metcalf [8200 tonnes capacity] built in 1922. 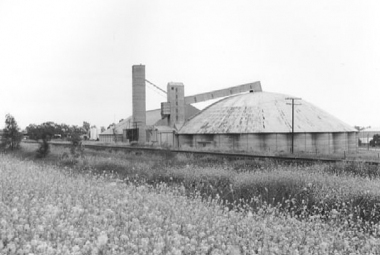 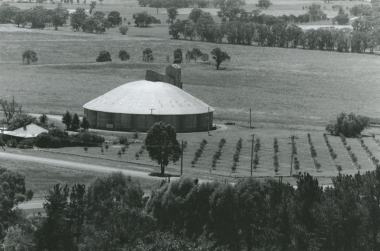 Also later steel silo ;date of construction and capacity unknown. 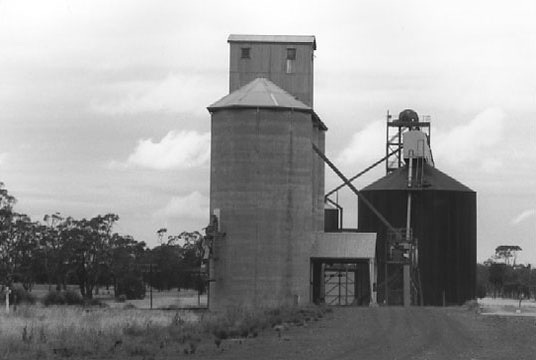 Location only, about 4 km west of Gulargambone. Construction date and capacity of concrete silo unknown, similar to other silos in NW eg Wee Waa.The larger bulkhead is a C288 [28800 tonnes capacity] built in 1968. Date and capacity of other bulkhead unknown. 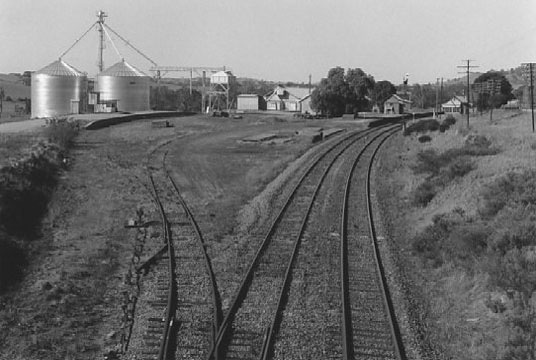 Wallerawang to Merrygoen line, defunct. 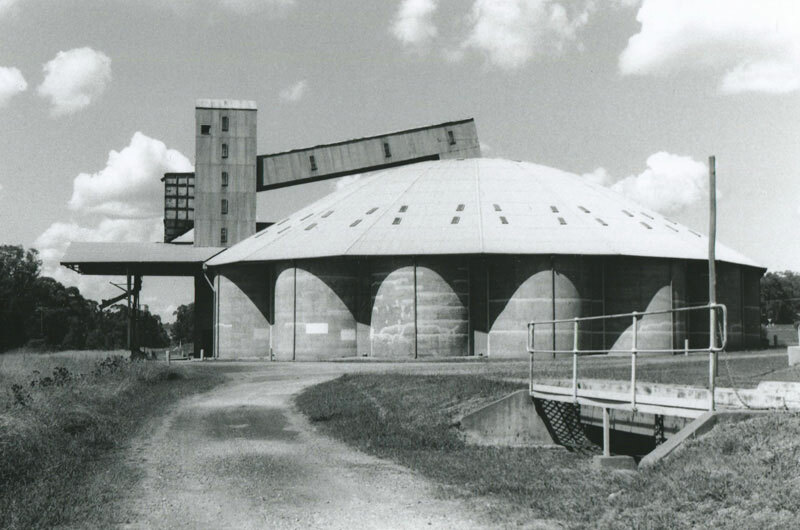 Scalloped concrete silo type A123 [12300 tonnes capacity] built in 1955. 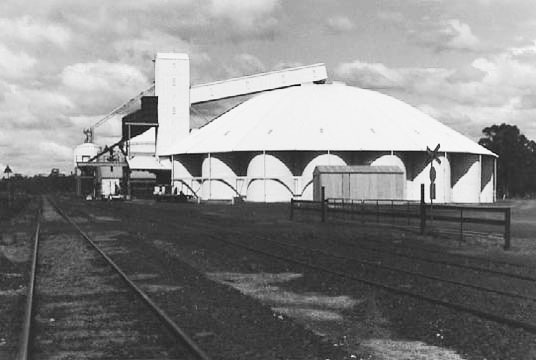 Also known as “A Depot. 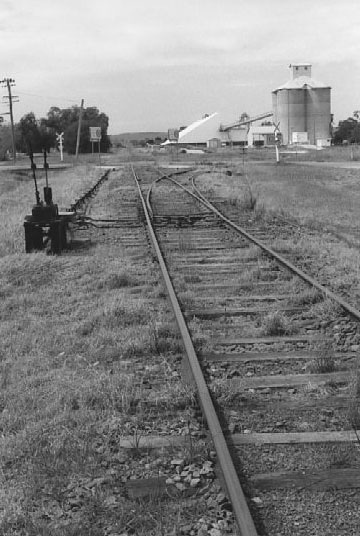 Located downline from railway station in town. Werris Creek to Moree line, operable. Concrete silo, construction date and capacity unknown. Steel bulkhead is C409[40900 tonnes capacity] built in 1966. 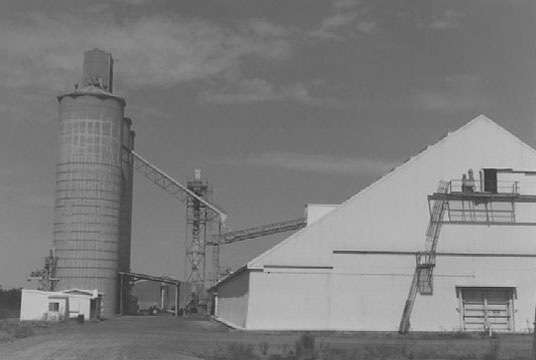 Scalloped concrete silo is A Depot, construction date and capacity unknown. 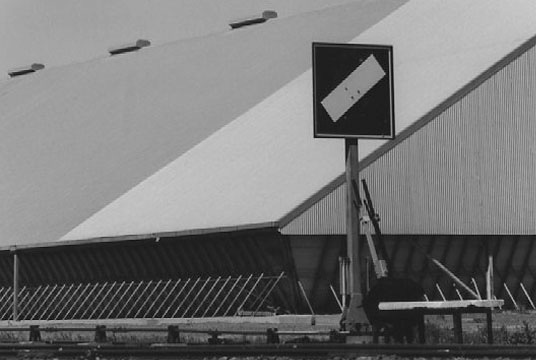 Steel bulkhead is C409[40900 tonnes capacity] built in 1966. 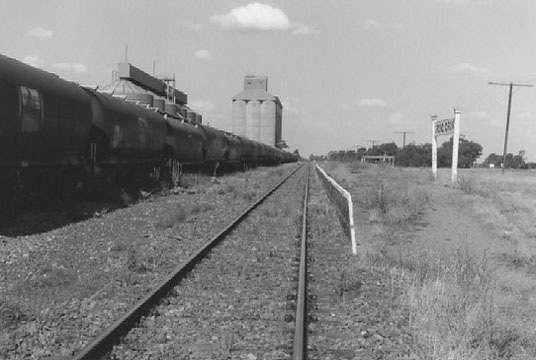 Werris Creek to Moree line,operable. Original concrete silo type S024[2400 tonnes capacity] built in 1930.Later steel silos; construction date and capacity unknown. 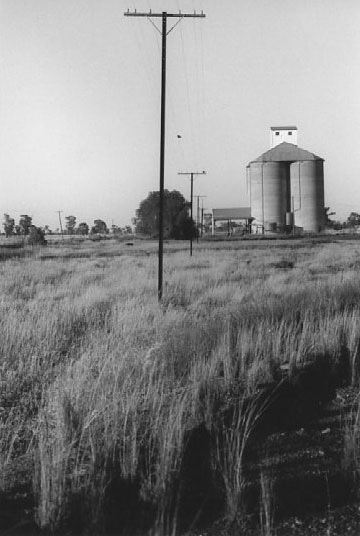 Located in village on Newell Highway. Moree to Werris Creek line, operable. 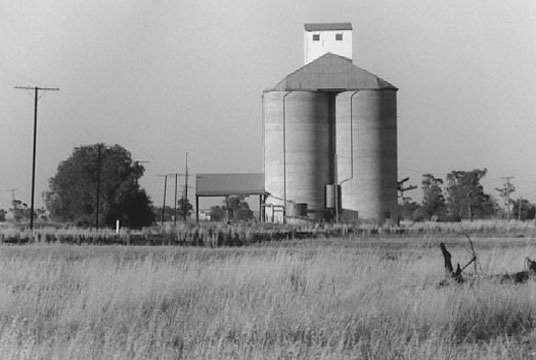 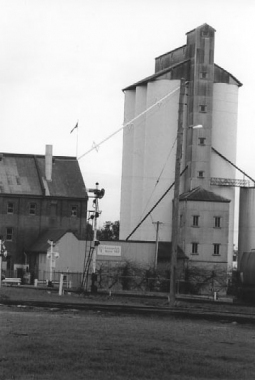 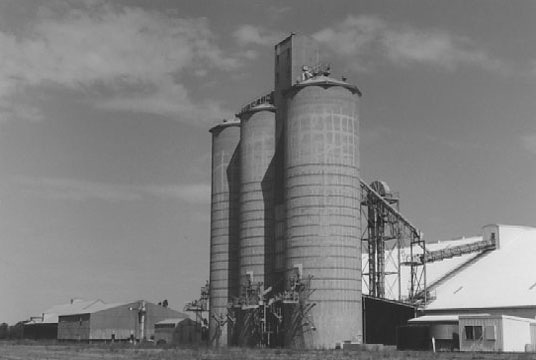 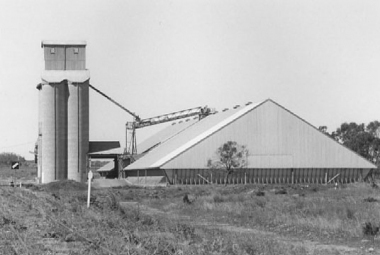 Tall concrete silos, construction date and capacity unknown. 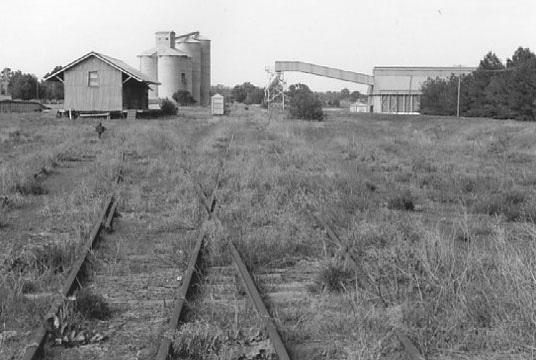 Binnaway to Gwabegar line abandoned. 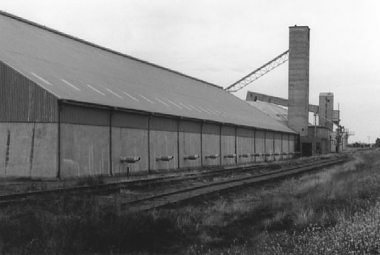 Steel bulkhead C288 [28800 tonnes capacity] built in 1968.